Over the past four-plus decades there’s a resounding theme from Taylor Guitars: passion for improving the guitar-playing experience. As a company that’s passionate about exposing more players to the pleasures of making music, Taylor isn’t content to see people throw in the towel before they have a chance to get their groove on. 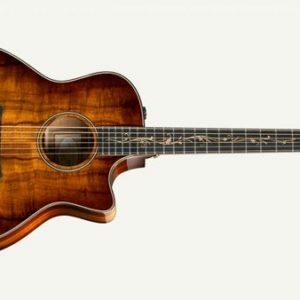 Models like the Academy Series Academy 12e-N Grand Concert Nylon String Acoustic guitar represents Taylor’s effort to support the development of the entry-level guitar player. Taylor believes that, in many respects, a player who is just beginning deserves the best-playing guitar. 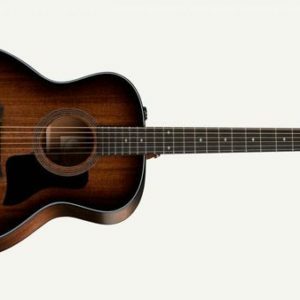 Most newcomers to the instrument — and parents buying for their kids — are understandably reluctant to pony up for a more expensive, “nice” brand of guitar without knowing whether the interest will last. So the approach tends to be: start with an inexpensive, “good-enough” guitar, and if things progress, upgrade to something better. But all too often this ends in hand-wringing frustration, where would-be music-makers walk away from the instrument blaming themselves for not having enough musical talent or physical dexterity, when in fact the real culprit all along was the guitar. The wood pairing is a solid Lutz spruce top with layered sapele back and sides. Genuine African ebony – not man-made substitutes – is used for the fingerboard and bridge, just as with all other Taylor models. The neck is a fully engineered version of Taylor’s patented design, allowing for precise calibration of the neck angle and smooth serviceability throughout the guitar’s life. The guitar’s top bracing and other internal architecture were optimized for volume and projection. It has full-size guitar dimensions. It has the right depth and width for the right internal architecture, with a seriously straight and true neck on it. These things were meant to go together as a whole without compromising musical function. 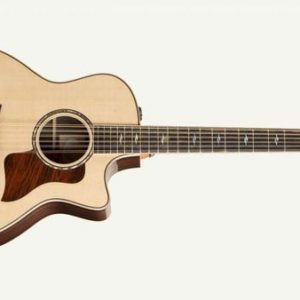 The Academy Series also introduces players to the best of what Taylor Guitars brings to the guitar market. Unmatched build quality, the most stable and playable necks, a vast array of tonal options, eco- conscious and ethically-sourced raw materials, and a lifetime of service and support.